At Newcastle Airport, we love showcasing the Hunter's local wine and food. So much so, we've expanded our already extensive range of artisan local products to include Hunter Belle Cheeses and Pukara Estate jams, straight from the Hunter Valley. To celebrate our new range of made-to-order Hunter cheese and dipping boards, we've put together a helpful wine-pairing guide so you can enjoy the ultimate Hunter feast before take-off. 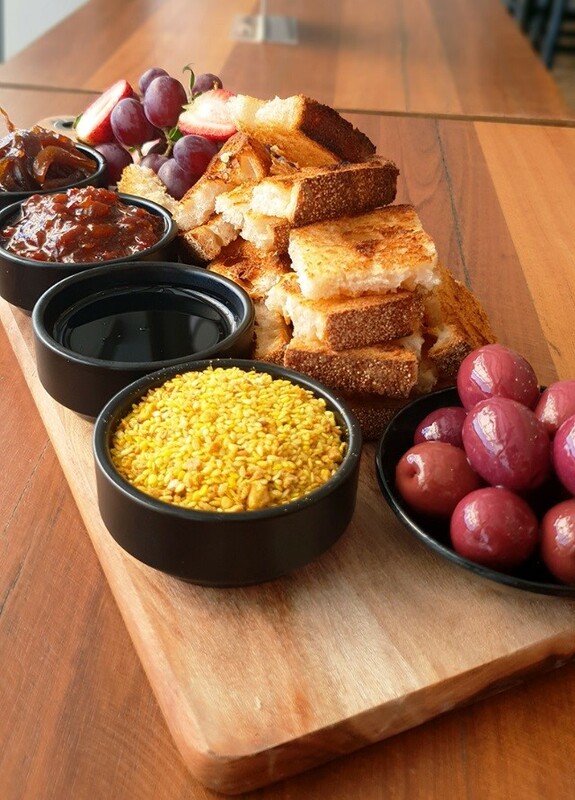 When it comes to variety, you'll be spoilt for choice with the Pukara Estate Dipping Plate. Served with crusty Snows Artisan sourdough, there are four premium condiments to choose from. The traditional dukkah mix combines cumin and coriander seed with the crunch of pistachios and hazelnuts. Pair this with Pukara Estate's rich caramelised balsamic vinegar and sourdough for a deluxe dukkah experience. If sweet and sour flavours are more your jam (pun intended), pick from two flavour-packed Pukara Estate jams. The caramelized onion jam is the perfect sticky and sweet treat to add to sourdough, while the capsicum and chilli jam adds a kick of chilli to spice things up. If creamy, buttery cheese makes you think "yes, please! ", you can't go past Hunter Belle's triple cream style Briebelle. It's soft and full of flavour, so there's none of the rubbery texture or bland taste you might get with other bries. Don't wait for once in every blue moon for Hunter Belle's smooth Blue Moon cheese at Broughton & Bay. This semi-hard cheese is a cross between soft blue and cheddar cheeses, making it the perfect starter blue cheese. If you want a hard cheese with a bold, smokey flavour, the Ol' Smokey is for you. This cold-smoked vintage cheddar transforms in taste from intense to delicate and creamy, making it an adventurous cheese sure to impress. If you can’t pick just one type of cheese, why not have it all with the Cheese Board? Featuring all three Hunter Belle Cheeses plus crisply toasted tortillas and char-grilled vegetable relish, you really can have your cake cheese and eat it too. Order all of the above boards, cheeses, and wines conveniently from Broughton & Bay in the Departures lounge.